As of January 11, 90.7 percent of Texas Children’s employees had received the flu vaccine. A special thank you goes out to all of you who have taken such an important step in protecting yourselves, your colleagues and our patients and families. Although we are excited to see so much participation across the system, we still want to encourage employees to get their vaccine. It is not too late! 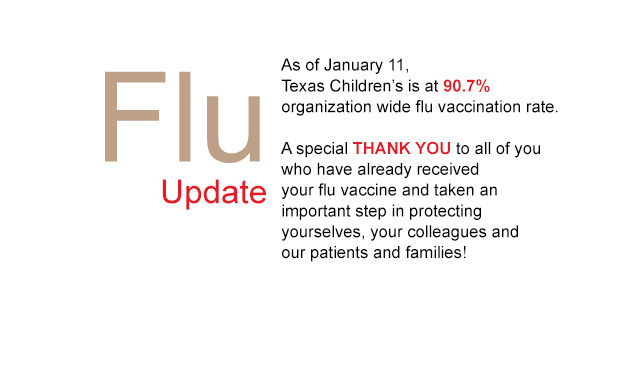 Employee Health continues to administer flu vaccines at no cost to Texas Children’s employees. The flu vaccine is also covered at 100 percent under our Texas Children’s Medical Plan, enabling employees to receive their flu vaccine at no cost through any in-network provider or retail pharmacy. If you have any questions about the safety and effectiveness of the flu vaccine, you may call Employee Health at 832-824-2150, option 2. Staff who do not receive their flu vaccine should wear a surgical mask when providing direct patient care services for the duration of the flu season, which was declared on December 19, 2018. See Required Influenza Vaccination Policy and Procedure for more details. Log in to the Employee Health and Wellness Portal. If this is your first time logging into the portal, click “Having trouble logging in” to reset your password. For instructions on how to log in to the portal click here or click here to view step-by step instructions. Once you log in, click on the “Forms” tab, then select the 2018-Flu Declination Form. Stay home when you are experiencing flu-like symptoms. If you begin to feel sick with flu-like symptoms while at work, call the Employee Medical Clinic at 832-824-2424. Wash your hands often. Clean and disinfect frequently touched surfaces at home and at work, especially when someone is ill.
For more tips on preventing the flu, visit CDC Flu Prevention.